as i mentioned last week, at the end of this month we’re off on holiday to italy and as a result i’m spending far too much time thinking about all foods italian. i normally focus on savoury dishes but a recent taste of some ricciarelli put paid to that. ricciarelli are sienese almond biscuits and they are a taste of heaven. the ones i tried, courtesy of my boss who was just back from his own italian jaunt, had an intense almondy flavour and a soft almost macaroon-like centre. i was still eating the biscuit i was given when i started looking for a recipe that i could try, that’s how good they were! judy, the diva from over a tuscan stove had a fabulous sounding recipe which i’ve now made twice (in as many weeks). if you have a soft spot for sweet almondy biscuits give these a go, they are incredibly quick and easy to make as well as being truly delicious. 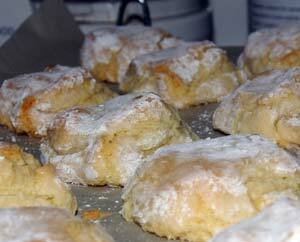 mix together the ground almonds, flour, baking powder and icing sugar. beat the egg whites until stiff and add them and the almond extract to the flour mix. mix well until you have a soft dough. sprinkle icing sugar on the kitchen surface. take one heaped teaspoon of dough and roll it into a ball, roll this in the sugar and then form it into a diamond shape, flattening the biscuit with the back of your hand (there are pictures on judy’s blog). place the biscuits on a baking sheet covered with baking paper and bake for 10-12 minutes until they are slightly golden. leave to cool then gently remove them from the paper.